From the pages of Life, a complex view of the mid-century commercial landscape. Left: from Life, June 27, 1938, photos by Margaret Bourke-White. Right: Life, July 24, 1970, photo by Michael Rougier. In Motel of the Mysteries, the illustrator-author David Macaulay narrates the epic tale of an archaeological excavation that happens two millennia after a 20th-century cataclysm has buried North America under a toxic stew of consumer detritus and junk mail. As a result, the artifacts of our civilization are preserved, like Pompeii, for discovery. With Piranesian precision, Macaulay’s drawings portray the now-familiar commercial landscapes of the automobile as an illegible and perplexing environment of infrastructural ruins, while his intrepid archeologists speculate wildly on the meaning of what they are uncovering. The vast network of stripes that covers the continent from coast to coast: surely these were extraterrestrial landing strips. The old signage mounted on giant poles that occur in regular clusters, relics of the quotidian honky-tonk of U.S. 1 or the pulsating grandeur of Nevada 604: obviously these are inscriptions demarcating ceremonial or processional routes. Much of the book follows a Howard Carter-like figure digging away at a site which the 20th-century reader will immediately recognize as a typical strip motel, with its massive sign, parking lot, standardized rooms, plastic ferns, and chipped Formica all astonishingly intact. Macaulay’s 25th-century archeologist is convinced the place is “a vast funerary complex.” Clearly the toilet seats are headdresses; the cars are “freely interpreted metal sculptures of animals … inscribed with such names as Cougar, Skylark, and Thunderbird.” 1 As Reyner Banham noted in a 1980 review, much of the book’s humor (when it’s not based on potty jokes) rests on the apparent absurdity that the 20th-century roadscape would ever be considered worthy of serious, scholarly, and systematic attention —though (as Banham knew) a Society for Commercial Archaeology had recently been organized and was already conducting field work along U.S. highways. 2 So let’s take Macaulay’s fictional archaeologist seriously, and remove tongue from cheek long enough to consider what sort of Rosetta stone would render the Motel of the Mysteries — and the innumerable and extensive auto-oriented landscapes that we have constructed in the past century — comprehensible to some future explorer. Life depicted the rapid expansion of postwar consumer culture and its dramatic impact on the landscape. For several decades in the mid 20th century, Life served as a “show-book of the world,” in the words of publisher Henry Luce. Luce launched the magazine in 1936 as a pictorial complement to Time, the pioneering newsweekly he had founded in 1923, and his goals were ambitious: to present to a national audience a “complete and reliable record” of all “seen events,” ranging from politics to art to design, from industry to sport to religion, from celebrities to ordinary citizens. In recent years scholars and critics have illuminated the ways in which the magazine fell short of this grand goal: Luce’s own editorial mandates, informed by his personal conservatism, limited what parts of the “dynamic social world” were actually shown in the pictures that dominated Life’s pages. It’s not surprising that Life attracted a largely white and middle-class readership throughout its thirty-four-year run. But if Life never quite became the “convincing reporter of contemporary life” that Luce once envisioned, it nonetheless offers us today, decades after the last issue appeared, a compelling historical and visual record of certain aspects of mid-20th-century “contemporary life.” 3 In particular, in its coverage of the American scene, Life depicted the rapid expansion of the consumer culture of the postwar United States and its dramatic impact on buildings, landscapes, and cities. To be sure, the coverage was hardly objective; Life, like Time, followed Luce’s dictum to give “both sides” of an issue, but also to “clearly [indicate] which side it believes to have the stronger position.” 4 In its commentaries, articles, and photo essays, the magazine sought to influence attitudes and shape perceptions of popular culture; and if Life sometimes betrayed a profound ambivalence, and many outright contradictions, this was because its critical attitudes were as fluid and fickle as popular culture itself. Nowhere is this clearer than in its coverage of the built environment: even as the magazine documented the emergence of new typologies and the evolution of new styles, it also sought to mediate conventional and longstanding distinctions between the elite and the everyday, the monumental and the quotidian — especially as these were embodied in the American highway and its commercial architecture. Life, June 3, 1957,”Ten Buildings in America’s Future,” at the National Gallery. In essence Gutheim is describing what we now understand as the extended — if not attenuated — urbanism of the postwar decades; he is referring to that shift in cultural and architectural focus then underway — the shift from center to periphery, from downtown to suburb, from skyscraper to ground-scraper. His curatorial choices make this clear: he ignores postwar urban landmarks like the Equitable Building, in Portland, or Lever House, in Manhattan, in favor of SOM’s Connecticut General Headquarters, in suburban Hartford, and Eero Saarinen’s General Motors Technical Center and Victor Gruen’s Northland Center, both outside Detroit. Likewise Gutheim includes two new low-rise, residential subdivisions: Charles Goodman and Dan Kiley’s Hollin Hills, outside the District of Columbia in suburban Virginia, and Vernon DeMars, Donald Hardison and Lawrence Halprin’s Easter Hill Village, in the East Bay beyond San Francisco. Thus was the AIA tacitly endorsing a future for architecture not in the traditional city but instead in the highway metropolis — in the developing territories of the automobile whose proliferating presence was creating a new variety of metropolitan settlement and a new kind of popular culture. As presented at the National Gallery, the new precincts of the car had an undeniably seductive beauty. These projects occupied the largest gallery of the exhibition, a chronological and visual climax consisting of twenty-one backlit transparencies, with wall-sized Kodak Colorama murals displaying those ten buildings in America’s future. Not surprisingly Life devoted several pages to the exhibition, with a text both descriptive and didactic; Nowicki’s State Fair Pavilion, a structure notable for its boldly parabolic form, was not only “a futuristic fantasy in a world’s fair,” but also a “solidly practical building.” Yamasaki’s St. Louis Terminal created a “spacious, dramatic effect” that was symbolically appropriate for the “air age,” even though its “simple structure” — defined by the repetition of its peaked, glass-filled concrete vaults — was designed specifically (and sensibly) to accommodate future expansion. Life, August 30, 1954, feature about the Northland Center, outside Detroit. By the time Life showcased the “airport arcs” and “shining shops” of the AIA exhibit, many of these “notable modern buildings” were already familiar to readers of the magazine. 8 For instance, when Gruen’s Northland Center opened, in 1954, its status as the largest shopping center in the nation had warranted splashy coverage. Life dubbed it a “20th Century Bazaar” and detailed every aspect of its design, from the circulation planning to the commercial art, from the extensive storefronts to ample parking. Northland was, the magazine concluded, a “fantastic combination of modern efficiency … fine architecture and pure gaiety.” 9 At the dedication of the General Motors Tech Center, two years later, Life was even more effusive, hailing the Saarinen-designed complex as a “Versailles of Industry” — a famous conflation of the palatial and corporate meant to emphasize the scale and grandeur of the new campus. 10 The magazine presented this merger of art, architecture, and landscape as manifestation of corporate prestige, and ticked off the impressive statistics: twenty-five buildings incorporating fifty-six miles of fluorescent tubing and 378 miles of wiring surrounded by a landscape featuring eleven miles of roads, eighty-five acres of parking lots, and 13,000 trees — all occupied by 4,000 GM designers, engineers, and executives. And more: Life predicted that the Tech Center would transform U.S. building practices through its innovative deployment of new materials and techniques, including glazed masonry, enameled steel spandrel panels, and neoprene window gaskets — all of which the it did in fact popularize. In the careful pairing of text and image, these photo-essays reveal the subtle but insistent agenda being promulgated by Life’s editors, one that sought to teach the American public — or at least the magazine’s six million readers 11 — how to comprehend a contemporary landscape that seemed to be changing with dizzying speed, everywhere spawning new building types and infrastructures and producing new forms and spaces. In the prospectus for Life, Luce had argued that the magazine’s purpose was to give the U.S. citizen the opportunity “to see and be amazed; to see and be instructed.” 12 In the postwar era, this meant instructing the U.S. citizen to appreciate modern architecture and design, to value master planning in commercial and corporate endeavors, to equate private development with the civic realm, and to discern quality and not just quantity in the built landscape. For Life, the tawdry state of the American highway had long been an editorial obsession. Life, June 3, 1957, display ad for Ford Fairlane. Life, June 27, 1938, with photos by Margaret Bourke-White taken on U.S. Highway 1 between Washington and New York. The U.S. auto highway system is the finest in the world, but its roadside is the most unsightly. No other country has permitted its scenic beauty to be marred by such endless mileage of hot-dog stands, signs, shacks, dumps and shoddy gas stations. … The ‘nation that lives on wheels’ … has the dubious honor of having created … the Supreme Honky-Tonk of All Time. From the vantage point of history, the editors’ perplexity comes perilously close to obtuseness: they seem unable to acknowledge the obvious relationship between, on the one hand, the proliferation of affordable cars so essential to the identity of the mobile modern American, and, on the other, the profusion of commercial architecture — all that “roadside junk” — that served the ordinary needs of motorists. In that same issue from 1938, the Dutchland Farms franchise is scorned by the editors as an example of commercial blight, while a display ad for the seaboard attraction promotes its “32 flavors of ice cream.” This unintentional irony would be played out across Life’s pages for decades, with editorial screeds decrying the American propensity for unregulated roadsides — “making way for a custard” — underwritten by colorful advertisements for corporations like Howard Johnson’s and Tastee-Freez. Such double standards may have resulted from lack of communication between Life’s editorial and marketing divisions or from contradictory interpretations of the contemporary built environment. Nonetheless they suggest an ideological gap — or perhaps what Henry Luce’s vision of corporate liberalism would have viewed as a delicate balance between the ideals of an orderly, planned environment and the pragmatic acceptance of the free-market economics. Top: Life, August 17, 1959. Bottom: Life, July 24, 1970. By 1970 a new generation was looking at the strip and seeing the genius loci of America. But as we know now, from the distance of history, it was already late in the day for this sort of diatribe. By 1970 a new generation was looking at the landscapes of the automobile — at all the blossoming blight— in an entirely new light. It was at this moment that painters and photographers like Ed Ruscha, Allan D’Arcangelo, and Stephen Shore, and architects and planners like Charles Moore, Robert Venturi, Denise Scott Brown, and Stephen Izenour, were beginning to scrutinize the expansive roadsides and to see, for better or worse, the genius loci of America. Today this seems unexceptionable; so it’s useful to be reminded how startling the new attitudes were at the time. In its 1972 review of Learning from Las Vegas, Life was skeptical; “anyone who sets out to beautify banality is an interesting type,” wrote critic Walter McQuade, revealing the degree to which he utterly misunderstood the book’s polemic. 22 By the time the broader culture grasped what it meant to learn from Las Vegas, and to accept the ugly and ordinary on their own terms, Life had already published its final issue. At the height of its popularity in the 1950s and ‘60s, Life magazine not only reflected cultural attitudes toward the burgeoning territories of the automobile, it also actively shaped them. In numerous articles and photo-essays, as well as in countless advertisements, Life showcased the good and the bad: it heralded shopping malls and corporate campuses while decrying the sprawling roadsides connecting them; it celebrated an expanding consumer culture while ignoring the connection between car-centric landscape and intensifying environmental blight. 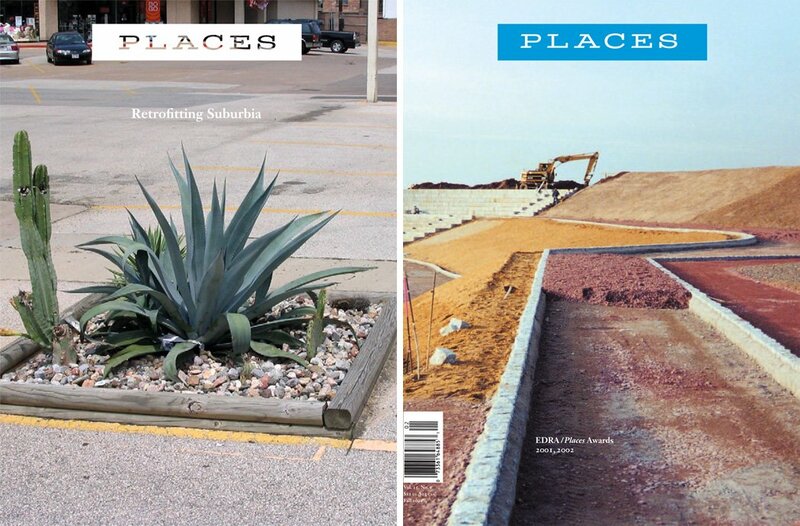 That all this was at once intentional and inadvertent underscored the complex ambiguities of the everyday built landscape as well the clashing editorial and marketing agendas of a popular magazine. Unapologetically and utterly without irony, virtually every midcentury issue of Life embraced the nation’s drive-in culture while condemning Ugly America. Ultimately it was just as well that Life wasn’t around to chronicle the changing attitudes towards the roadside that emerged in the 1970s and even today remain fractiously in flux. The complex and — of course — contradictory debates about high art and mass consumption, elitism and populism, Pop and Postmodernism, would have been difficult to capture in photo spreads and witty captions. As for the archeologist laboring on the side of the highway a few millennia hence, we needn’t worry. Thanks to institutions like the Smithsonian, the Henry Ford, and the Neon Boneyard, the artifacts of the American roadside have become museum pieces. The motel is no longer a mystery. “Ugly America” is adapted from a chapter in Archi.Pop: Mediating Architecture in Popular Culture, edited by Medina Lasansky and just published by Bloomsbury. It appears here with permission of the publisher and author. David Macaulay, Motel of the Mysteries (Boston: Houghton Mifflin Company, 1979), 39-40. Reyner Banham, “The Haunted Highway,” New Society, 52 (June 19, 1980), 297-99. Henry Luce and Archibald MacLeish, “Prospectus for Life,” 1936, 1, 3. Alden Whitman, “Henry R. Luce, Creator of Time-Life Magazine Empire, Dies in Phoenix at 68,” The New York Times, March 1, 1967. Jacob Deschin, “Group Exhibitions” The New York Times, June 9, 1957, Arts & Leisure section, p. 136. Leslie Judd Portner, , “Growth of Architecture Told in Exhibit,” Washington Post, May 14, 1957, p. B1. Frederick Gutheim, One Hundred Years of Architecture in America, 1857-1957 (New York: Reinhold Publishing, 1957), 13, 64. Life, June 3, 1957, 59. Photojournalist W. Eugene Smith shot each with great theatricality, in extreme close-ups or lit from within at night, emphasizing the formal drama and glassy modernity we now readily associate with mid-century architectural glamour, an effect enhanced by the fluorescent tubes that illuminated them in the AIA show. Life, August 30, 1954, 82. Life, May 21, 1956, 102–107. The accompanying photographs, by Andreas Feininger, documented the building and its materials, revealing the ways in which the Center was “like the automobile itself”: mass-produced, colorful, efficient, stylish and pleasing to the eye. The photos also portrayed the Center as a coherent composition of “unusual beauty,” best explained, the editors suggested, by reference to modernist abstraction such as “a complex creation” of painter Fernand Léger. Henry Luce and Archibald MacLeish, “Prospectus for Life,” 1. Douglas Haskell, “Architecture and Popular Taste,” Architectural Forum 109 (August 1958): 104-109. Mary Mix Foley, “The Debacle of Public Taste,” Architectural Forum, February 1957, 104-109. Foley’s piece provides some historical context for Robert Venturi’s later critique: “When they see the magnificent and precisely machined General Motors Technical Center in Life magazine, they are momentarily impressed. But the esthetic it embodies touches their daily life no more closely than the unearthly beauty of a jet-propelled rocket. If they see a modern house they call it a chicken coop.” See Robert Venturi, Complexity and Contradiction in Architecture (New York: MoMA, 1966). Unsigned editorial, Life, June 3, 1957, 34. The commentary was most likely written by chief editorial writer John K. Jessup, who would have been well aware of Henry Luce’s evangelizing views on the “American Century,” a socio-political construct Luce introduced in an 1941 Life editorial. Luce argued that the 20th century was the American Century due to the nation’s emergence as a world power and its inevitable leadership across a spectrum of world affairs, from the political to intellectual to scientific to artistic. Paul Peter, Life, June 27, 1938, 5. Elsewhere in the same issue is a photo essay promoting summer tourism. Color photographs of man-made and natural landmarks like the Taos Pueblo, Mount Rushmore, and the Grand Canyon accompany a series of regional maps suggesting “what to see in America.” In an act of willful graphic denial, the maps depict the monuments as floating freely above invisible highways, while the editors cheerfully proclaim: “With his roads and automobiles the modern American is the world’s most mobile man. William Whyte, “A Plan to Save the Vanishing Countryside,” Life, August 17, 1959, 88. Peter Blake, “Astride the Open Road,” Life, December 24, 1965, 49. Paul Ylvisaker, “The Villains Are Greed, Indifference — and You,” Life, December 24, 1965, 92-93. Ralph Graves, “Nobody we met seemed to care,” Life, July 24, 1970, 1. Loudon Wainwright, “Blight Blossoms on the American Highway,” Life, July 24, 1970, 1. Walter McQuade, “Giving them what they want,” Life, April 14, 1972, 17.